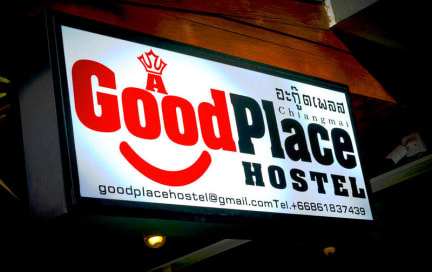 A Good Place Hostel i Chiang Mai, Thailand: Bestill nå! A Good Place is located on the North side of the old city, which is famous for its Chang Puak Night Market, Tapae, Wualai Walking Street, Muay Thai stadium, Kad Suan Kaew (Shopping Centre), Wat Lok Moli (Buddhist Temple), and wide selection of night clubs. At A Good Place, there are 3 room types. On the first floor, there is 2-bed dorm, 2 shower rooms, and 1 bathroom. 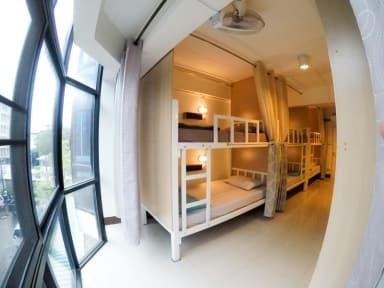 On the second floor, there are 10-bed dorm, 2 shower rooms, and 2 bathrooms.The third and the forth floor,there are 4-bed dorm. Each spacious room comes with air-conditioning, high-speed WiFi, secured lockers, and international plugs. An outside terrace and lounge area is open 24/7. 1. Check-in time is between 14.00 and 23:00. 2. Check-out time is before 12:00. 4. Cancellation Policy: At least 3 days advance notice before the arrival date is required. 5. Age Restriction: The minimum age to stay at A Good Place is 15 years old. 6. The reception is open from 7:00 to 23:00. 7. Smoking is not allowed inside the hostel.